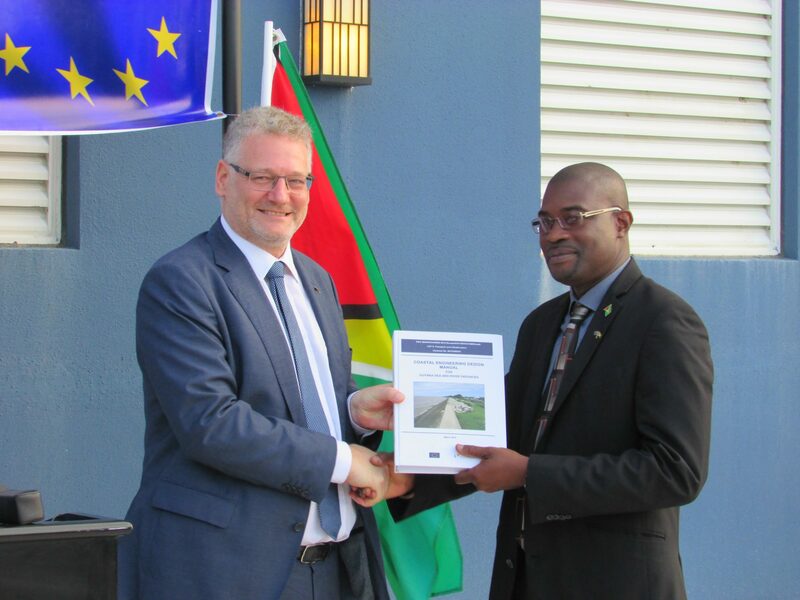 Minister of Public Infrastructure, David Patterson, today (right) received a final copy of the Coastal Engineering Design Manual for the Guyana Sea and River Defences from European Union (EU) Ambassador, Jernej Videtič. A release from the Ministry of Public Infrastructure said that Guyana also received EU funding to the tune of $2B for sea and river defences. This funding was received by Minister of Finance, Winston Jordan, on behalf of the Government of Guyana. He further deemed the $2B disbursement as “extremely heartening” and said that the administration had inherited a situation which made it unable to access the EU funds immediately. “So, while this disbursement represents a great payment towards our coastal zone protection, it also represents a stride forward for this administration,” he said. Ambassador Videtič said that sea and river defences have been an important feature of the relationship between Guyana and the EU. Noting that Guyana is “particularly vulnerable to rising sea levels and coast erosion” of both natural and manmade sea defences, the release said that the Ambassador emphasised that Guyana needed to develop its capacities to adapt to its vulnerabilities. The aim, he added, was to limit the negative impacts of rising sea levels and climate change.